Time to VOTE for the RECYCLE! Project QUILTING Challenge! The Story: I was very close to my Nana. When we visited her my son would always insist on a “4-generation hug” with Nana, my Mom, me and him. When she passed away at 98 last March I helped situate her things, and never quite got around to dropping some of those clothes at the Goodwill. So for this challenge, I collected clothing and linens to make a family heirloom miniature. The top star is my Nana, with 3 shirts, 2 pairs of pants, and a piece of silk scarf. The right star is my Mom, with pieces from 2 shirts, 2 skirts and a pillow. The bottom start is me. Instead of taking the opportunity to make mine out of my most pretty items, I chose to use everyday pieces like theirs were. Mine is 2 of my favorite t’s, a blouse, and bits of my favorite silk skirt. The lace doily is from my Great Aunt (Nana’s sister), and it’s floating over my son’s khaki school pants. The green polka dot (which is also on the back) is from a valance that I made for my Nana a couple years ago. I satin-stitched the binding and stitched one of my necklaces on for the border. I hung a little Celtic Knot pendant from the necklace clasp, which had been a gift to me from my DH. 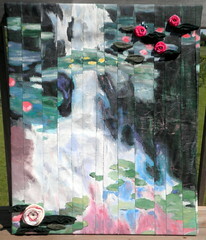 We are all gardeners, so I quilted some abstract roses to encircle us in our garden. The final piece measures 15″ square, with each block measuring 5″ square. The Story: Wow! This project was right up my crafty alley! I started with two pillow cases..one white and a flowered one. I then quilted the white case starting at the top with blue threads and then fading down to the bottom with green threads. I then used an old green button down shirt for all the greenery and the binding on the piece. 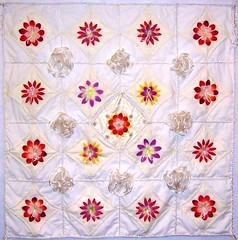 I then cut up the flowered pillow case and thread painted them to the quilt. The embellishments I added were the buttons from the shirt, flower beads from a kids necklace, barrettes that my nieces were too old to wear and flowers from an artificial flower arrangement. (btw…you can’t really see the shirt buttons as they are under the flower beads. I just used them to make the flower beads ‘pop’) The butterfly trail of beads are from a big bag of sparklies I got from the thrift store a while back. Everything I used was from stashes I already had which had been purchased from the thrift store….. Including the thread! So that means I recycled stuff that had already been recycled! Aprox. cost for all supplies was about $2.50. Oh, and one more thing. I know some people might turn up their noses at my thrifted supplies, but I love using recycled items in my crafts…it makes me feel so very green! The Story: I have recently begun to hand sew and have been wanted a place to keep everything organized. 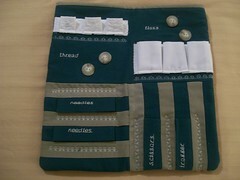 This kit has for everything needed, including two large pockets for patterns and fabric pieces. My Recycled Quilt had previous lives as a son’s police academy uniform shirt, my horse show shirts and a blouse that I was planning to love on me when I lost 10 pounds (that wait is over!) Two of the embellishmenst came from the handle of a gift bag and the buttons from another old favorite shirt (stress the ‘old’). Since it was okay to use new thread, I used lots! 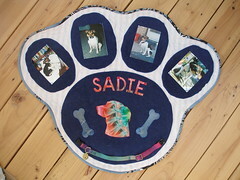 The Story: For our challenge quilt this week my daughter suggested I use some of our sweet little dog’s things. She passed away less than two months ago and we still think we hear her and expect to see her any moment. She was with us for 12 years since she was 6 weeks old. I used two of her blankets for the paw print and background and then various scarves and parts of clothing she wore for the applique. I embellished with her collar and photos held in place by thread in the corners. The backing and binding are from fabric I got at a thrift store. This was really out of my comfort zone working with fabrics other than just cotton and this is my first time making a different shape quilt other than a rectangle or square. Definitely a challenge for me. The Story: I recycled some old clothes that were in a bag to bring to Goodwill. There was a green flowered suit jacket that I had a hard time parting with, but it never did fit me right. So this way I still get to look at it. I started with a trip around the world, then added some appliques of the flowers from the jacket. My embellishments are those flowers, some silk flower leaves and little white buttons. The quilt measures 18.5″ x 23.5″. It’s a good size for a dolly quilt or a wall-hanging. The Story: There is a very long story to go with this piece. In 1996 I was in 8th grade and a member of my middle school Odyssey of the Mind Team. Part of the challenge for the skit we had to create was to paint one of the paintings from the list and incorporate it into our play. I chose to paint Water Lilies, by Claude Monet en.wikipedia.org/wiki/File:Claude_Monet_-_Water_Lilies.JPG. We then had to cut my painting in half and we glued it to these cardboard box contraptions so that when I ‘fell through it at the museum’, the boxes would flip into the new scene. Anyway, this was one of those things I could never get rid of but didn’t really know what to do with it. We didn’t have a corner to put it in so it was actually hanging on the wall going downstairs to our basement (which you can only see if you go to the basement). THE STORY: I have been saving my son’s shirts since he was little. 2 of them are even little onesies. When I saw the challenge this week I just knew what I was going to do. He’s 7 now and kept asking me to make him his t-shirt quilt so I whipped it up. I am not a huge fan of the actual “quilting” process so I used the front and back of the shirts and created 10″ rag blocks with flannel. Most of the shirts are blank on the back, but a few have designs or words so that just added to the quilt. I knew I needed to use 3 embellishments so I attached a little lizard toy on the cozumel shirt, a bracelet my sister bought him on the “my aunt loves me” shirt and a button that fell off my sweater on the “O” of the Old Navy shirt. The quilt is so heavy with the 2 sides of the t-shirts and 2 layers of flannel! He LOVES his new quilt and I feel so good that it is complete. I am still saving more shirts to either add to this one or make another as he grows older. To embellish the quilt I used three materials: tulle, silk flowers, and satin cording. It measures 46″ square. The original dress contained 117 yards of tulle (yes, I measured), edged with white satin cording. My mom had wrapped the dress in a sheet, which kept it fairly clean but didn’t keep the white satin from turning ivory. The fact that the satin had turned (and the coating on the pearls was flaking off) helped me come to terms with cutting up this lovely dress. I settled on a cathedral window style pattern for the blocks. I used the underskirt and sheet to make the main part of the blocks, and in the centers are silk flowers pulled from an arrangement, covered by squares of the tulle to protect them. I removed many, many yards of the satin cording and braided 3 strands together. I used this braided cording to outline & quilt the blocks, and it is also used for the binding around the edge. I also took small pieces of it to use as the centers of the flowers. On the original dress were these beautifull tulle roses with sequin beaded centers; I used those as embellishment around the center block, which is actually the bodice of my gown. If you count the silk flower centers, there are exactly 17 – the age I was when I wore this dress. When I made the first cut into this dress, I got really sad and had to step away from it for a couple of days. You have to understand how much I loved this dress when I was younger, and part of me at 17 believed I would wear this at my wedding. My 33 year old self knows that was a silly (but endearing) idea, but that’s what coming of age is all about. This weeks randomly drawn public prize will win this lovley wristlet made by me! KimsCraftyApple! Read below on how you have seven chances to win! SEVEN Chances to WIN! Entry 1: REQUIRED! Leave a comment on your favorite entry and vote for your favorite on the poll on the upper left hand side of the blog. – ***MUST DO*** Optional/Additional Entries – please note – if you want to qualify for these additional entries you must leave a SEPERATE comment for each – if you already follow or are a fan, etc just leave comments saying each. If you write everything in ONE comment you only will have ONE entry… Entry 2: Follow my blog. Entry 3: Tweet about this fantastic contest with hashtag #PQRectangles (important or I won’t know you did it) Entry 4: Become a Fan of Project QUILTING on Facebook:http://www.facebook.com/ProjectQUILTING Entry 5: add my Project Quilting ‘Grab my Blinkie’ to your blog or blog about my giveaway (link your blog or post in your comment, please) Entry 6: Head on over to KimsCraftyApple and let me know your favorite item in the store! Entry 7: Sign up for my newsletter in the upper right corner of this page! ***Participants in project quilting ARE allowed to enter in the public poll/contest as well. *** This means you have SEVEN chances to win! I need you to write each of these entries as different comments in order to qualify you for all seven entries and include your email address. If you don’t include your email address I won’t be able to contact you when you win and I will have to choose a new winner. I will be picking the winner at 7pm on Friday, June 18th. I voted for PennyFabricArt because it's a beautiful piece and I like the story behind it. I have your blinkie button on my blog. I voted for Kims Crafty Apple, because my niece and nephew were involved with Odyssey of the Mind and Destination Imagination and I've been a judge in those competitions! I voted for SpringWaterDesigns. 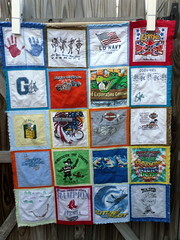 I love the way she incorporated her cub scout memorabilia into the quilt. wow great entries. I voted for spring water designs, i liked the story and the use of the recycled objects. glad i found you! Im a follower as well now. Im now a fan on facebook too. Glad to find more quilting friends there! This week was tough, again! 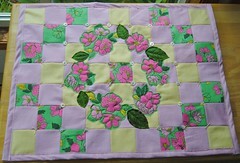 I love the theme – I have used recycled fabric for every quilt I have made (only 2 so far). 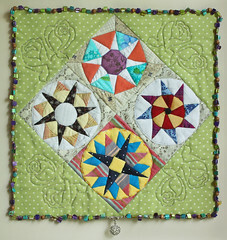 I liked PennyFabric's for the story behind it, the roses quilted on, and the necklace border, and the colors, and the pinwheel design, I guess I could go on…but will leave it at that! Great job EVERYONE!!! 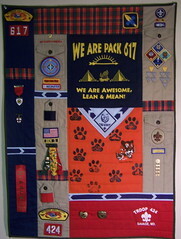 I voted for SpringWater Designs Boy Scout memories quilt. Really love LoveBug's submission. A beautiful repurposing of a gown (and what an inspiring idea for all of those bridemaids dresses I never worn again! Love the recycle theme. Hope to see it again. I voted for SpringWater Designs Cub Scout memories quilt. I think it was a great idea and inspires me to make one for my son! I have become a follower! I was going to become a follower anyway because I am thinking about joining in Season 2! You all seem to be having way too much fun!!! 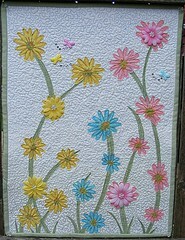 I am now a fan on Facebook Project Quilting! Wow everyone is so creative! I can't decide who to vote for. 1. My favorite is LoveBugStudios, gorgeous! 2. I follow your blog…and enjoy every post!! As usual, it was difficult to decide which of the many great entries was the best. I decided on Kim's Crafty Apple. These stories are all so inspiring and the results are fantastic. Truly a fun weeks worth of entries. Excellent work everyone. I think I am going to have to eenie meanie miny moe to vote. I was a hard decision but I voted for the Lady bug Studio one. If I won I would get the Flower Ladies Tote bag. I'm delighted to vote for Penny Fabric Art! Talk about recycling…some of HER GREAT GRANDMOTHER'S clothing is in there! And the idea, theme, layout, each star…..DEFINITELY, the winner! I follow your blog! and thanks, Kim, for always taking the time to do this for the rest of us! I chose Flora the Owl from your store…just too cute and very original…talk about recycle! 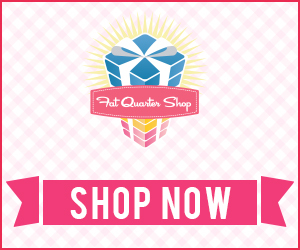 I am voting for PennyFabricArt. I like the story and the bright colors. I liked the piece from Quilter because of the colors. I voted, but under duress! LOL It's sooo hard to pick just one! I loved all the stories and how creative each quilter was in the use of recycled materials. I voted for Kim's Crafty Apple. It must have been hard to sew that canvas with all the paint etc on it. The end result is like a painting in itself! I am a fan on FB. I tink my favorite thing in your store is this bag. I was going to sign up for your newsletter, but the button is only half there and won't work. It's probably just my computer. I'll check back later. I am in such awe of all your crafty quilting! Awesome work, everyone. I voted for Karen’s Crafty World. It is so pretty!